Full of vibrant green ingredients, Fresco Burger is the restaurant’s latest special burger release to join the menu. Nando’s Fresco Burger is available from 5th June for 12 weeks. 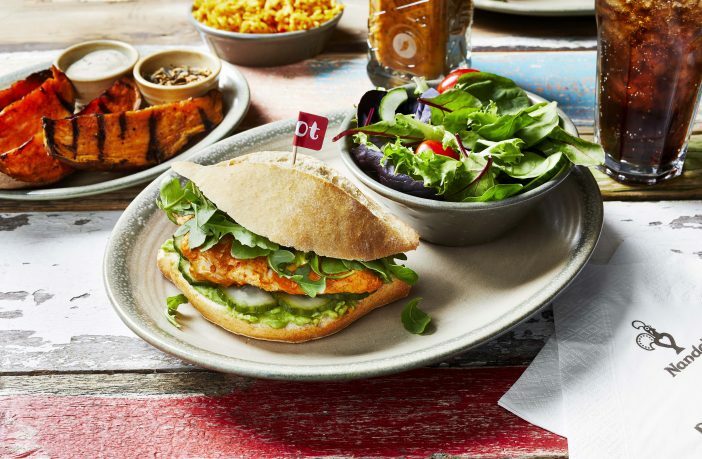 Nando’s announces its brand new Fresco Burger, available just in time for summer! Nando’s today announces the launch of its brand new Fresco Burger, which will be available across the summer for 12 weeks from 5th June – 3rd September. Teaming with greens the Fresco Burger is the perfect PERi-PERi compliment to the summer months. Sunshine in a bite – Nando’s Fresco Burger is a tall and generous build of vibrant tasting ingredients, made up of a concoction of Nando’s famous PERi-PERi chicken fillet, tangy pickled cucumber, peppery rocket, and fan favourite crushed avocado – all sandwiched into Nando’s renowned Portuguese roll. Available both in restaurant, and for Nando’s takeaway and delivery, Nando’s Fresco Burger is the perfect solution for those who want to enjoy the sunshine but don’t want to miss out on their PERi-PERi fix. Nando’s Fresco Burger will be available from Tuesday 5th June for 12 weeks, and is priced at £7.95. For further details, visit: Nando’s Online.